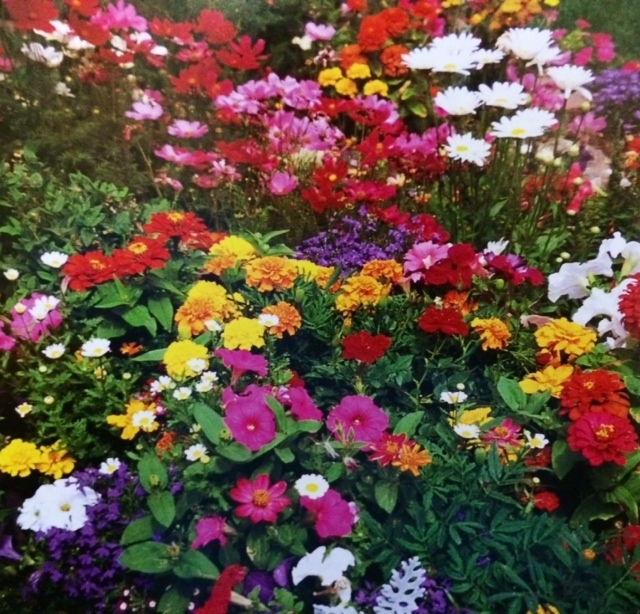 When buying annuals, perennials, or vegetables, avoid leggy or wilted plants. inexperienced gardeners will be disappointed at their lack of success; disgruntled, they will rush back to the nursery with their pathetic purchases, their dismay matched only by the gloom of the sellers. To prevent squirrels or other miscreants from digging up newly planted bulbs, throw a few mothballs into the planting hole. A pair of kitchen scissors is a useful garden tool. Deadheading, decapitating copulating slugs, digging out shallow rooted weeds and cutting string are among their many uses. Tie a colored ribbon around your small tools; if you lose them in the unmown grass, they’ll be easier to find. If you are stung by a bee or hornet and are allergic to them, elevate the limb and apply ice packs to the area. Contact your doctor. Please yourself; that way you’ll be sure of pleasing at least one person. Livening up inexpensive clay pots. Wipe the exterior of the pot with a damp cloth. Attach masking tape vertically to make as many stripes as you want. Paint the entire pot white (including tape). When the paint is dry, remove tape. The result will be a white pot with perfectly straight orange stripes. 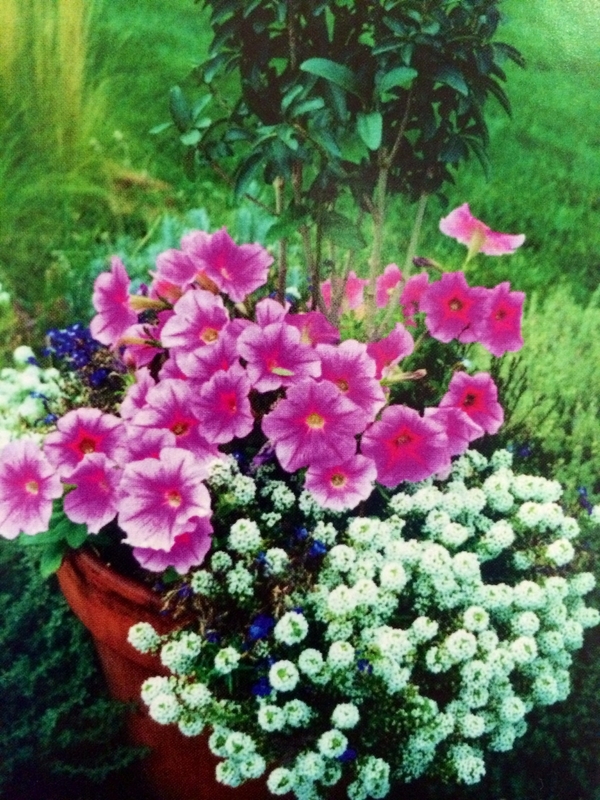 Plant with either boxwood or with annuals or perennials of the same color. Line several of these pots against a wall or along a path for a striking look. 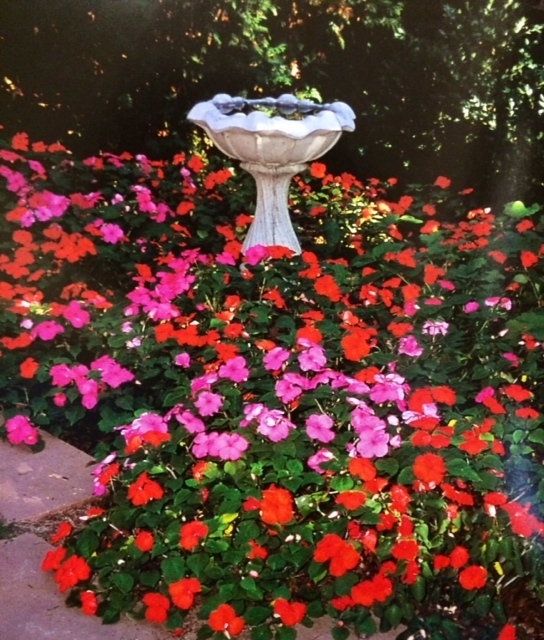 Vibrant flowers surround a fountain. Great choices make for healthy flowers. 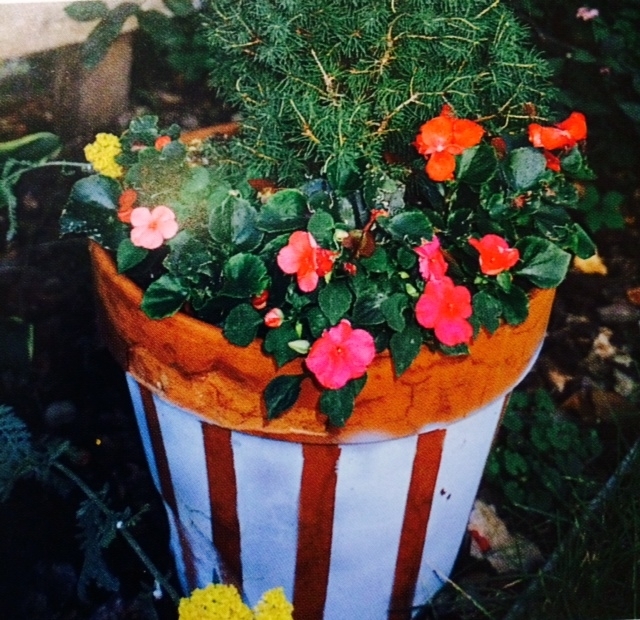 Potential DIY project for the spring – decorating a simple clay pot!